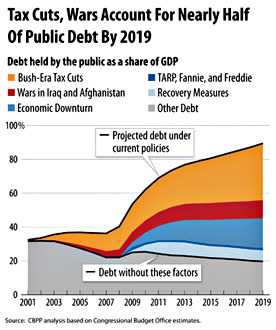 [This chart] shows that the Bush-era tax cuts and the Iraq and Afghanistan wars — including their associated interest costs — account for almost half of the projected public debt in 2019 (measured as a share of the economy) if we continue current policies. Altogether, the economic downturn, the measures enacted to combat it (including the 2009 Recovery Act), and the financial rescue legislation play a smaller role in the projected debt increase over the next decade. Public debt due to all other factors fell from over 30 percent of GDP in 2001 to 20 percent of GDP in 2019. Put this one up on your refrigerator along with the last one. Then, if a friend comes over after watching Glenn Beck and insists that we’re doomed, just point to the chart. If you want to save America from a crushing future debt burden, you need to repeal the Bush tax cuts, get out of Iraq and Afghanistan, and stop pursuing austerity policies that will slow down economic recovery. Once we’ve done that, then it’s time to talk about Medicare. But the other stuff comes first.